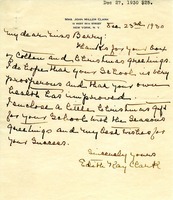 Mrs. Clark writes to thank Miss Berry for the box of cotton and encloses a little gift with the season's greetings. 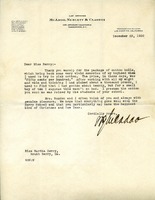 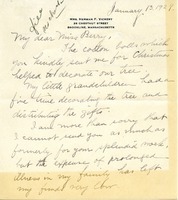 Ellen Chase is thanking Martha Berry for the Berry Christmas Card and the cotton she sent her. 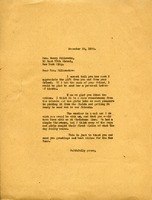 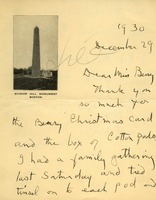 Chandler writes on behalf of Mrs. Walton, who has been ill. Walton sends thanks for the Christmas cotton and requests literature about Berry for herself and for Dr. Belk at the Bryn Mawr Hospital. 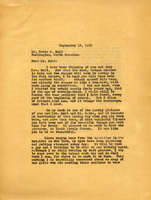 Jane Bossie, secretary to Mrs. Carll Tucker, writes to thank Martha Berry for sending cotton, describing how Mrs. Tucker's young son took the cotton to school to show his friends. 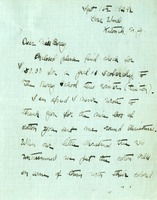 Josephine P. Taylor writes to thank Martha Berry for sending cotton to her and her mother, Mrs. T.D. 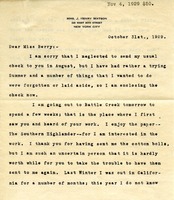 Palmer, describing passing the cotton on to friends who have never seen it growing. 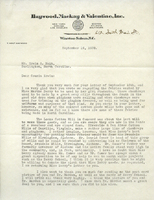 Elizabeth Stone sends a check for a scholarship for tuition. 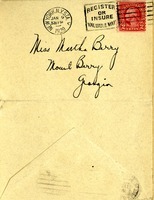 She also thanks Miss Berry for the box of cotton she received last Christmas and explains that they decorated their Christmas tree with it.